The Wind River Range is home to one of the largest wintering herds of Bighorn Sheep. The Wind River mountain range in Wyoming is outside of Yellowstone National Park but is a part of the Greater Yellowstone ecosystem. The focus of Trip 1 is on Yellowstone National Park, which has man-made boundaries to it. But wildlife does not necessarily care about these boundaries (unless there are fences that hold them in). Wildlife will go wherever the conditions and habitat are suitable for them. You can think of an ecosystem as a natural boundary that contains all the organisms that prefer similar types of habitats. In this case, the Greater Yellowstone ecosystem's boundaries are where the alpine and forested areas change into lower desert-like areas and shrublands composed mainly of sagebrush and have few to no trees. Ecosystems are also defined by their physical characteristics. An example of this is temperature. The Greater Yellowstone ecosystem tends to be cooler in the summer than the surrounding shrublands. So animals that prefer cooler habitats with trees, for instance, will naturally stay in these areas. It's not that animals in the Greater Yellowstone ecosystem don't have the freedom or ability to venture into the sagebrush, they just don't very often. It could have to do with their food. A large animal may be fine without trees and with hotter temperatures, but the things they eat may only like forested areas and cooler temperatures. That will keep the larger animals around just for that fact. There can be a lot more complexity to an ecosystem but this gives you an idea. The point is that the Wind River mountain range has habitats similar enough to those in Yellowstone that it is part of the same ecosystem. Many plants and animals that are at home in Yellowstone are also at home in the Wind River range and may travel between the two areas. A significant contrast you will notice is how much less-crowded this area is than Yellowstone National Park. Hiking anywhere in the Wind Rivers will give a much deeper sense of solitude. At the southeastern portion of the range is Sinks Canyon. Here you can see the Popo Agie River dive underground into a cave, not to resurface for a quarter-mile downhill. Really! The current theory is that there are enough tiny spaces in the rock at the back of the cave that all that water can usually flow through them. During the Spring snow-melt, there is too much water flowing to fit into the cracks so the river flows over into a secondary channel. But usually, it all sinks into the ground at the place called "The Sinks" and it resurfaces at a place called "The Rise". Performing tests using dye in the water, it has been determined that the water takes two hours to make its quarter-mile journey underground. But there is actually more water coming out of the ground at the Rise than goes into the ground at the Sinks! So what's going on? Why does it take so long for the water to go a quarter-mile and why is there more water coming out than goes in? No one knows for sure, but it is likely that groundwater from other sources joins the water from the Sinks to create the volume observed at the Rise. Here is where the Popo Agie River sinks into the ground. At the Rise, you will likely see many trout swimming in place against the mild current created by the flow of water (see main page picture). Most of the trout are Rainbow Trout but there are also Brown Trout. The trout can go no further upstream because the spaces in the rocks through which the water flows are too small. Another animal you will likely see in the area around the Rise is a bird called a Black-Billed Magpie. You may also see Lazuli Buntings feeding on insects, Common Mergansers diving for smaller fish, or a Muskrat building a den. 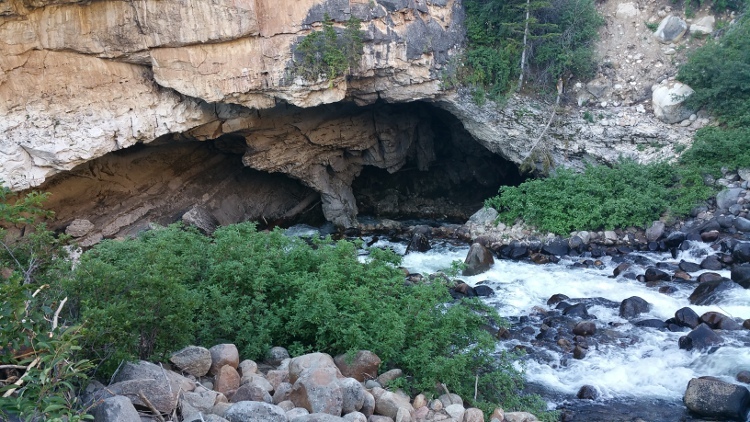 Sinks Canyon is an area where you get both aspects of experiencing life. There are good opportunities to see living things and there is this rare phenomenon of the river going underground that is something fascinating to experience. Towards the northwestern end of the Wind River Range is the Dinwoody valley, where you can experience the turquoise waters of glacial till lakes. Glacial till is the mess of rocks eroded from a mountain by glaciers. Part of what makes up glacial till is "rock flour", which is the finest sediment ground up from the face of a mountain by glaciers. As water from snowmelt picks up this rock flour and flows into a lake, the rock flour can stay suspended in the lake for a long time, which makes the water look cloudy. If the rock flour is composed of the right kind of rocks/minerals, it can produce a brilliant turquoise color. If you zoom in on the location of the Dinwoody Valley in Google Maps, you can see the turquoise color. Compare the lakes in this valley to the lakes in the Torrey Valley, mentioned below. More brilliantly-turquoise lakes can be found in the Canadian Rockies but these in the Wind River range give you an idea of what they're like. Further north still, at the range's northeastern tip, in Dubois, WY, is the National Bighorn Sheep Interpretive Center. At the Center, there is information on the subspecies of bighorn sheep native to North America. This is a good place to explore the meaning of "subspecies", to examine taxonomy/classification in general and to learn about one of many types of mammals to be experienced in Trip 1. The center also provides a self-guided bighorn sheep tour brochure that takes you into the Torrey Valley, just to the south of Dubois. There's no guarantee you'll see sheep but the area is known to be home to one of the largest wintering herds of Rocky Mountain Bighorn Sheep, the Whiskey Mountain herd.